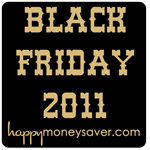 The Old Navy Black Friday 2011 ad is available! (These are a few of the top deals they have shared, to see a full list check out LuvaBargain.com or to view the Ad Scan here. ) Old Navy is open on Thursday, 11/24 from 9 am – 8 pm. There is an in-ad coupon for THURSDAY only for $10 off any $50 purchase. Then they will close the store until Midnight. When they open a limited amount of people will get a Free Kodak EasyShare Sport Waterproof Digital Camera w/$40 Purchase . They will hand out wristbands that you can take to the registers.